There is no shortage of sad songs with lyrics about betrayal, relationship breakdown, divorce, loneliness, unrequited love, guilt, insecurity, angst, and a host of other associated emotions. In a bizarre sort of way, we love these sad songs, and they frequently become the greatest and most memorable hits, maybe because they touch the deepest part of our souls, and we can all relate to them to some or other degree. The lyrics of these songs speak what the heart feels. “Her initial writings were always very introspective. Probably her most profound lyrics are from ‘73 Family Portrait, which deals with the emotional trauma of a marriage breakdown seen through the eyes of a child. It goes without saying that all the emotions exposed and explored in all these sad songs fall squarely within the sphere of psychology, and this is within the ambit of the work that psychologists do. But, it should come as no surprise that all these very same emotions are encountered in the field of family law, which is the work that family lawyers do. 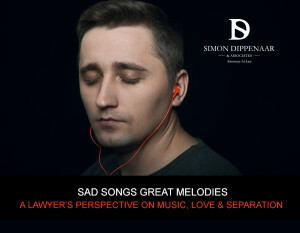 Divorce, custody issues, adultery, splitting of estates, financial need, domestic violence, are some aspects that elicit the most highly charged emotions, and at Simon Dippenaar & Associates Inc., we encounter these on almost a daily basis. The problem is that law is about finding legal solutions to legal problems, and generally, it is a sad indictment on both the legal profession, and the court system, that they adopt an attitude that is detached from the deep and delicate psychological aspects associated with family law matters. Consider divorce. From a legal perspective, it is merely a legal act to dissolve the marriage, with little consideration given to the psychological effects on those embroiled in the legal fray. Yet, divorce is arguably one of the most emotional and painful processes that one can experience, with consequences that are so far reaching that they could easily affect the rest of one’s life, let alone the effect it has on any children of the marriage. If the truth be told, for many, the only ‘psychologist’ they will see during any traumatic legal issue, will only be their attorney. overlapping relationship between psychology, and the practice of law. Our practice is people oriented, rather than law oriented. Yes, we work within a legal framework, but we bridge the gap between merely applying the law, with an appreciation and cognisance of the varied human emotions involved in each matter that we deal with. At Simon Dippenaar & Associates Inc., we consider it an injustice not take into account the psychological aspects involved in each case, and that’s why we seek to mold our legal approach to accord with each client’s specific needs. We avoid litigating for the sake of litigating, rather we carefully tailor our legal approach to reduce negative psychological ramifications, especially for any children involved. We strive for collaboration from all parties, use mediation where appropriate, and also work closely with mental health professionals. We know that any new start, will only be as good as the solution obtained. Speak to Simon if you need assistance: sdippenaar@sdlaw.co.za / +27 (0) 86 099 5146.